When it comes to the history of British comics you will often come across the name of Barrie Tomlinson. As a writer and editor he impacted the British comics scene with such title as Death Wish, Survival, Tiger, Scream, Dan Dare, Ghost Squad, Eagle, and Scorer for the Daily Mirror. Now he plans to release a new book, Comic Book Hero, which tells of his days as editor of some of Britain’s most famous comics. 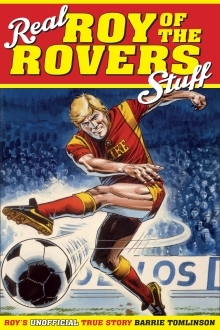 His current book Real Roy of the Rovers Stuff is now on sale, which is all about how he worked with the great Roy of the Rovers and made the character a national treasure. In his new book Barrie tells how Tiger became one of the most popular sporting comics and how the top celebrities of the day queued up to be part of the Tiger scene. The star writers for Tiger read like a who’s who of sport: Trevor Francis, Gordon Banks. Tony Greig, Geoffrey Boycott, Mike Channon, Jackie Charlton, Charlie Nicholas, Ian Botham, Malcolm Macdonald and showbiz stars such as Ernie Wise and Paul Daniels. There are stories about editing Scream comic and the trouble it caused. How Speed sped on to the scene and disappeared equally fast. How Barrie’s big ambition to relaunch Eagle was fulfilled and how photo-stories caused some problems. How he took Teenage Mutant Hero Turtles to almost a million copies per issue and how he didn’t manage it with Toxic Crusaders! All the comics editorial stories are in the new book, plus the author’s work on annuals and specials and his 22 year stint producing the six-days-a-week Scorer football strip for the Daily Mirror. It’s a book packed with photographs and nostalgia! COMIC BOOK HERO is published on September 1st 2017, by Pitch Publishing and will be priced at £14.99. Alan Partridge to return to the BBC!